In past issues of Obispoensis, I have noted some of my observations on the impact of invasive plants in our state – their negative effects and a bit on their historical introductions. 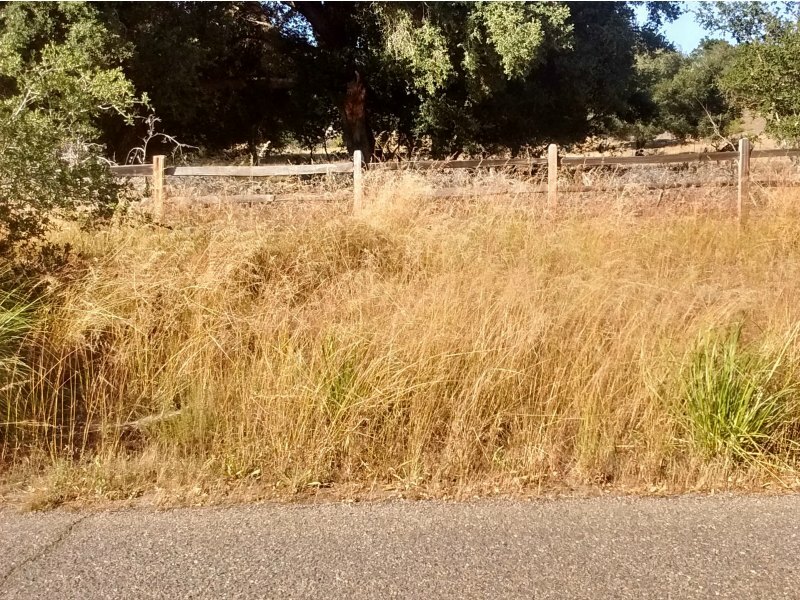 My musings on the origins of such a domineering presence by these plants, led me to machinations on how alterations to our California landscape invariably trigger chronically weedy areas that don’t seem to ever go away. It is unfortunate that once the native landscape is significantly altered, invasives race in and dominate for, well, forever! There are examples of this all around us, where invasives out compete their native counterparts by germinating earlier, by flowering earlier or flowering later, by flowering more abundantly, or by simply over growing them. In fact, I’d be willing to wager that every time a land parcel on the Central Coast is disturbed, its ability to return to its former, diverse self is seriously hindered, if not eliminated. Can someone show me a landscape that has successfully regenerated to its former self after significant disturbance? An excellent example of how permanent the impact of disturbance can really be, is clearly illustrated along the Union Pacific Railroad right-of-way, not far from my house, where it winds through vineyards south of the SLO County Airport. According to historical records, that rail line was completed in 1895. As one walks through the area today, it is choked with the usual cast of characters; two species of mustards (Brassica sp. ), wild oats (Avena sp. ), bristly ox tongue (Helminthotheca echiodes), prickly lettuce (Lactuca serriola), Italian thistle (Carduus pycnocephalus), milk thistle (Silybum marianum), purple vetch (Vicia villosa), Canadian horseweed (Erigeron canadensis), fennel (Foeniculum vulgare), fountain grass (Pennisetum setaceum), curly dock (Rumex crispus), and a Class B noxious species, Russian knapweed (Rhaponticum repens); all of this along with an occasional coyote brush (Baccharis pilularis). So, for more than 120 years, this area has been left to the quirks of nature to restore itself to its former self. And in a century’s time, only an few coyote brush grow there, along with a gang of opportunists, better able to thrive than the natives they’ve replaced. Like the zebra and guagga mussels in the Great Lakes, and the Asian collared doves in North America, the introduced and now naturalized exotic plant species are here to stay, at least for the conceivable future. As we approach land development going forward, we now know that if we disturb the land, the chance of realizing a full restoration event on that parcel is next to impossible. We also know restoration is an expensive proposition (plants, irrigation, and management), that more than likely will end in failure, as well. It is tough! Hence, the more competitive, more aggressive introduced species that abound in disturbed areas here, are now actually part of the “new normal” – they’re here to stay. The way I see it, it’s time we welcome these visitors as permanent residents in this environment, and therefore, integral participants in our California landscape. 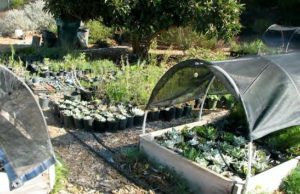 For a native plant novice like me, joining the California Native Plant Society seemed like a good idea so I became a member of the San Luis Obispo chapter. My spouse and I attended our first meeting a year ago last October. That is where I met Marti and the real fun began. When we arrived at the San Luis Obispo Veterans Hall for the meeting, there were several folding tables set up containing bowls, cups, and bags filled with native plant seeds. I spotted a box with little brown envelopes and another with tiny pencils. Some people were pouring small amounts of seeds into envelopes and writing on them. We did not have any seeds to share so we were standing there not sure what to do when Marti approached me. Marti assured me that it was not necessary to bring seeds to participate and she encouraged us to select some seeds to try growing for our yard. Walking up to one of the tables, I realized that we might have some difficulty identifying the seeds because the containers were labeled with botanical names. Sigh. My spouse noticed one that said Lupinus succulentus. Aha, surely that must be a lupine. Every year, I admire the lupines that grow on the surrounding hillsides and I was excited by the prospect of growing some myself. We asked someone and learned that yes, the seeds were lupines. We carefully put some seeds in an envelope and labeled it. Moving on, I found Marti’s seed stash. I was pleased to see that she had attached pictures to her seed packets and included their common names. I recognized the photo of the tidy tips and we carefully poured some itty-bitty seeds into another envelope. With help, we identified three more species of seeds to try including California buckwheat, coffeeberry, and purple needlegrass. 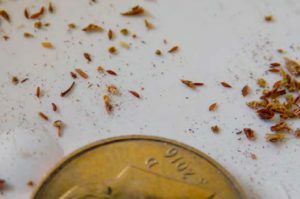 Why I waited until January to sow the seeds remains a mystery. I placed the pots on the deck outside of our dining room so I would remember to water them periodically. The day I spotted the first tiny lupine seedling poking its head through the soil, I was almost giddy with excitement. Other seedlings soon joined it. Watching the plants grow, develop buds, and then unfurl their flowers was fascinating. Only one of the California buckwheat seeds germinated. It grew into a small plant that seemed ready to graduate to the yard this fall so I planted it in a small fenced-in section of our yard to safeguard it from hungry deer. There is something magical about growing a native plant with your own two hands. Perhaps it is because it connects us to a time when people lived in harmony with the rest of nature. 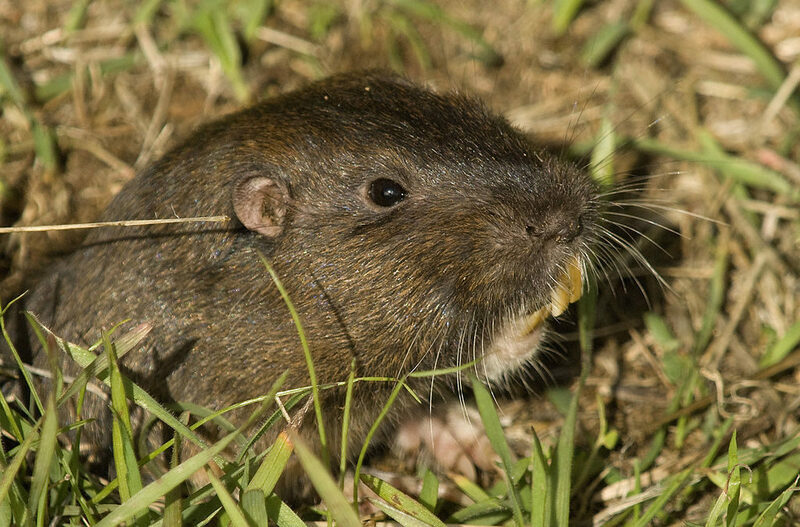 Last month we discussed California ground squirrel problems, this month I will focus on the gopher aka Botta’s pocket gopher (Thomomys bottae). For most of us, gophers can sometimes be a headache but a livable one. They come and go between you and your neighbor’s yard, only losing a couple of plants a year. For yards like these I recommend using gopher root baskets. These baskets are designed to last for years and will allow the plants some long-term safety against limited attacks. 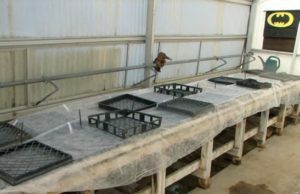 The wire baskets come in different sizes to fit whatever you plant; 1 qt., 1 gal., 3 gal., 5 gal., and 15 gal. Place the wire baskets around the roots before planting. I prefer never to use gopher poison, as the likelihood of some non-target animal eating the dead gopher is not acceptable. For those who have a severe problem with gophers, I recommend using a gopher gasser. The gasses will travel down the tunnel and the gopher will succumb to carbon dioxide. The most important thing in using gopher gassers is the soil must be well irrigated. The water will trap the smoke inside the soil particles allowing the gasser to be more effective. I have to mention gopher trapping. There are many traps to choose from, its up to you to consider trapping. I do trap gophers but only in those yards that have severe infestations. The cover of this Obispoensis is another beautiful water color by Heather Johnson. When I chose this beautiful and accurate representation, I expected that I could just go to my archive and update an article I had already written. To my surprise, Bonnie hadn’t drawn and I hadn’t written anything about it. I’m going to use the excuse that Hummingbird sage is so distinctive and so common that we took it for granted that everyone already knew it. It was one of the first California wildflowers I learned after I arrived in California from the Midwest. In our area Hummingbird sage can grow in an extensive mat. Its leaves are large (10 in (20 cm) long and 3 in (8 cm) wide). The leaf surface appears quilted. Its family affiliation (Mint or Lamiaceae or Labitae) is shown clearly in Heather’s water color. Its large red, two-lipped tubular flowers appear in our area by March and last well into summer and are borne in tight clusters; the clusters climbing upward resembling the balconies of an oriental pagoda. The two stamens and single style extend from under the upper lip in succession. The stamens appear first and after all the pollen has been removed they are replaced by the stigma at the end the style. Mint family characters also shown are the opposite leaves and the square stem. Unfortunately, the characteristic mint odor characteristic of this family is fruity (I smell lemon), but either way it’s not discernible in Heather’s art. I’ve found three common names for this mint. They are crimson sage, hummingbird sage, and pitcher sage. The first two names are readily explainable. The usual flower color is dark red (crimson) and red is the color of flower that hummingbirds frequently visit. 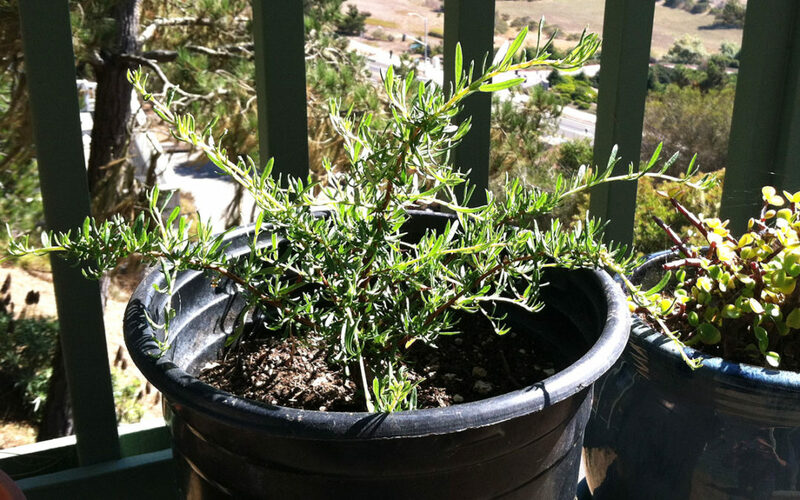 The name, pitcher sage, requires a little history. 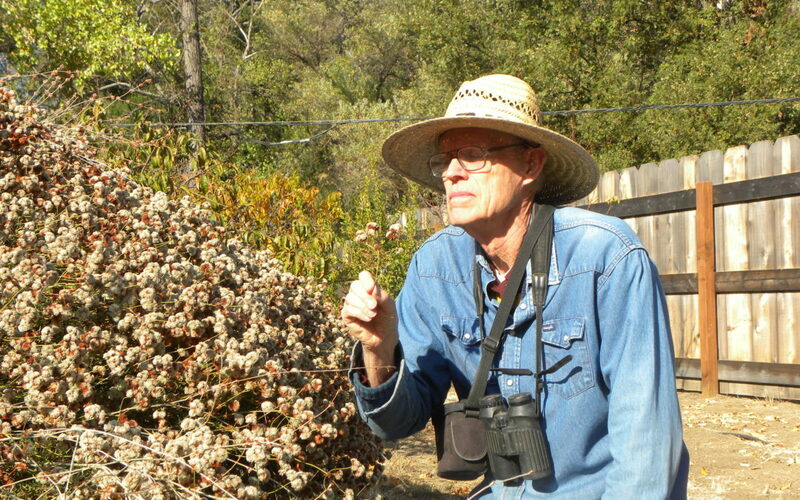 When I came to California in the late 1960s, the only wildflower books readily available were authored by the Southern California botanist, Phillip Munz, and emphasized Southern California common names. In those books Salvia spathacea was given the common name ‘pitcher sage’. So, we botanical oldsters probably remember it by that name. 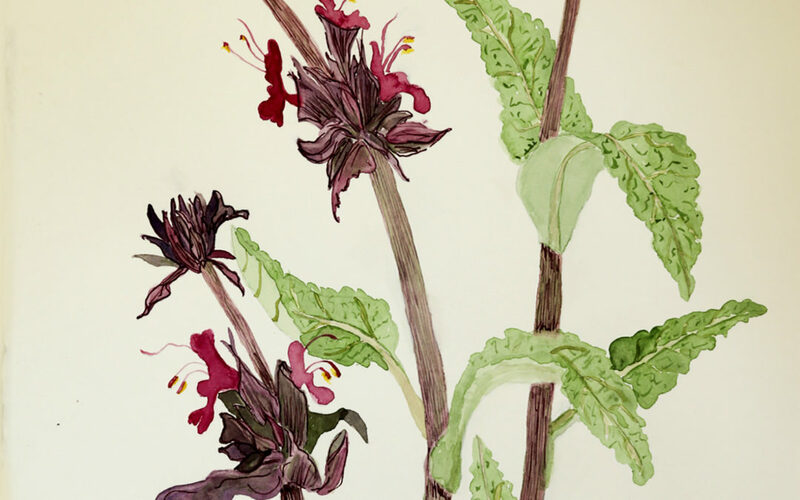 However I remember that hummingbird sage was always the name used on field trips in our area even then and the name, ‘pitcher sage’ was used for a completely different shrubby mint, Lepechina calycina, which grows in the interior mountains of our chapter area. Based on my observations and the numerous accounts on the web, hummingbird sage has a place in a California Native plant garden, especially gardens away from the coast. It prefers partial shade, but where it doesn’t get too hot it can tolerate sun. It even does well under oaks. It even prefers clay soils rather than sand. For areas that have many deer, they seem to avoid eating it. Its large flowers with lots of nectar make it great for attracting and feeding hummingbirds. I suspect the best situation in which to plant them would be an area that is visible, but little trod upon. Here it can even become a sort of ground cover. I found no real references for its use in medicine other than for ailments in which its wonderful odor might be helpful. According to the book on Chumash Ethnobotany, the Cumash didn’t have a name for it although the early Spanish settlers did. Some suggested it might make a decent tea. No member of the genus, Salvia, was in any of the indices of books on poisonous plants I have in my library. Please open up your calendars!! Isn’t that refreshing? I’m NOT asking for money, only a little bit of your time. You may have noticed the book and tee shirt table in the back of the meeting room each month, it not only serves as a free library before the meetings but it also generates quite a bit of the capital we need to keep our group funded. Problem is, this spring Linda, David, and myself are spread too thin. That’s where YOU come in. We could use some help behind the counter at some of our meetings and events. You can be as involved as you like: selling and writing receipts, report on the sales after the meeting, even order books. Please consider a few hours to keep us operating! If you’re interested send me a note, and I can give some of the dates and details. I’d love to hear from you! It’s really a task you’ll enjoy- what could be better than talking to other plant enthusiasts and helping them find a suitable book/poster or good looking tee? AND THANK YOU to all of you that have helped many a cold evening by setting up or packing up our inventory!!! Many hands really does make light work. Last month I wrote about my curiosity for the origin and distribution of some of the invasive plants that have become naturalized on the Central Coast. I continue this month with exerts from historical accounts. These come from an article published in the Bulletin of the Southern California Academy of Sciences, October 1920, entitled “The Immigrant Plants of Southern California”, by Samuel Bonsall Parish, a noted amateur California botanist. 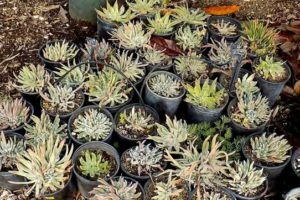 In the article, the author reports historical data on 281 non-native species observed in Southern California at that time, citing reports from some of the earliest botanists who visited the area, as well as stating his own views on this subject. 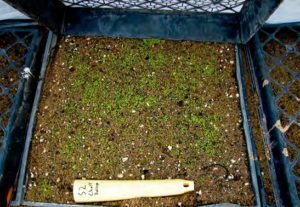 Here are four exerts of the article, addressing early plant introductions, two putatively during the “Mission era”, or pre-gold rush, and two thereafter. 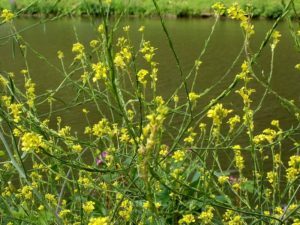 Brassica nigra, Wild mustard: Abundantly naturalized as a “ruderal weed” and also in grain fields. 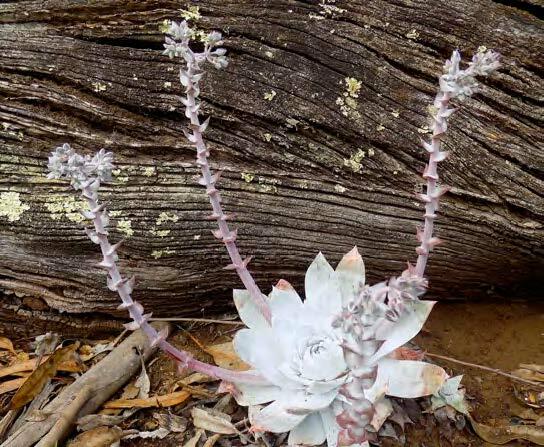 In the coastal district, in the rich adobe soils of the hills and mesas, it often covers wide areas with a close growth 5-10 feet high, excluding all other vegetation. It is sometimes harvested for the seed. 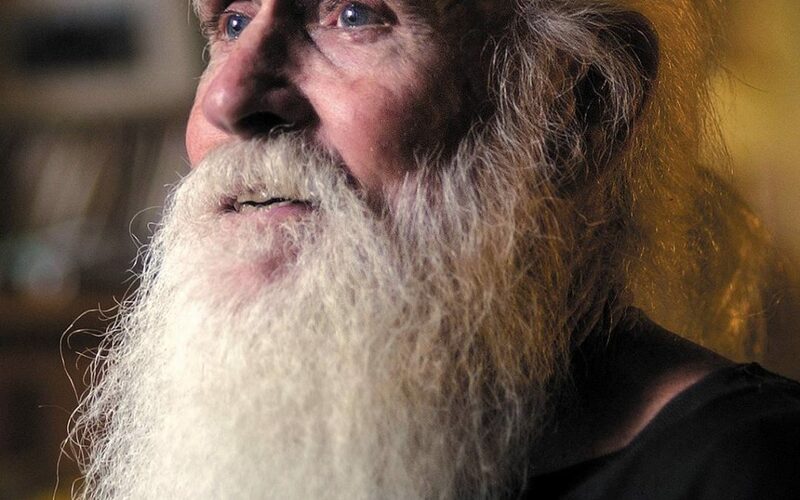 It was certainly introduced during the Mission era, and there is a persisting tradition among some Spanish-speaking Californians that the Mission fathers were accustomed to carry the seed with them and sowed it by the wayside. This seems improbable, but the fathers no doubt grew the plant in their gardens, as the young leaves are relished by the Mexicans and others, too, as a pot herb. The seeds would be scattered by the small birds, who freely eat them. 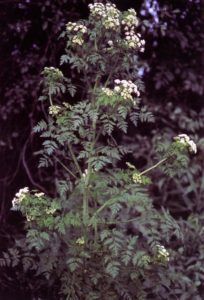 Conium maculatum, Poison hemlock: Introduced into ornamental cultivation under the name of “Carrot Fern” around 1905, soon escaping and now frequent in wet places and abundantly naturalized in willow thickets along river beds. Widely distributed in localities throughout the state, but probably of recent introduction. 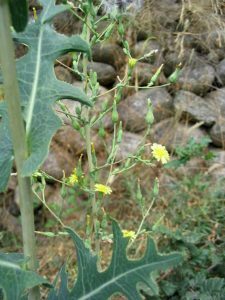 Lactuca serriola, Prickly lettuce: naturalized and common. A very recent immigrant, but here as elsewhere, its diffusion has been rapid. 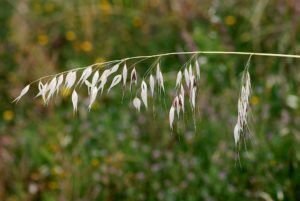 The species is an abundant weed in cultivated grounds, gardens, roadsides, and waste places, but they do not make their way into unbroken dry hills and mesas. While an obnoxious weed, these plants have not proved themselves so injurious in this region, as they are reported to be elsewhere. The earliest records for this state are: Berkeley in 1890, Sacramento in 1891. Thus, intentional or unintentional, the vast array of exotic species naturalized in this state were clearly human-caused events, often out of ignorance and oblivious to what was to follow. Every introduction to California apparently has its own unique story, how it was thought to be of ornamental or agricultural value, or how it just hitchhiked its way here. I think as CNPSers, we need to keep a look-up for unusual species and report them to the County Ag Department, if it is something new to the area.